Question: I have a number of Moss terrariums, all are open top. I must go away for two weeks this december and was wondering what your advice would be on watering? Do I just seal them up and let them do their thing? Answer: I am forever warning against condensation build up in terrariums. 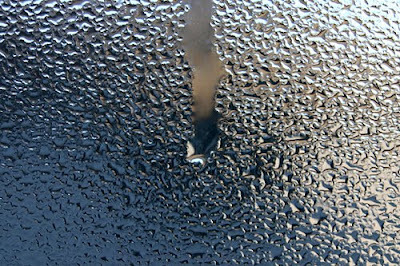 It can lead to rot and fungus growth and can be difficult to "dry out" a terrarium once the condensation appears. One way to avoid condensation is to maintain "open top terrariums" - which require more TLC (and more frequent misting) to keep hydrated. But what to do over an extended holiday? Pack up your terrariums and take them with you! Haha. I'm joking. Lid them up. This is one circumstance where a little extra condensation will not do any grievous harm. If you have large "mouthed" open-top terrariums you may want to consider obtaining sheets of plexiglass or acrylic at your local hardware store and balancing them on the tops of your terrariums to form a lid. If the openings are smaller (ie. a bottle terrarium etc.) you can top with anything that fits- even cap the opening with a piece of foil. If you are worried about the condensation you could try a test-run with a lid for 48 hours. If the condensation is overwhelming after the test you may want to try a lid with some holes punched in the top to promote airflow. A yogurt lid with some holes or anything similar would suffice. If it's a large "mouthed" terrarium that's getting too wet with a lid you can try balancing an acrylic sheet a little off-kilter to leave a small opening. Upon your return home if you find your terrarium soaking wet you can remove the lid and dangle a strip of absorbent paper towel into the terrarium that touches the surface. This will act as a wick and after a few hours you would be surprised how much moisture it can absorb.